Dubai, UAE - 4 July 2018: Modhesh, the ever-smiling mascot of Dubai’s summer, welcomes all families living in the UAE to bring their children down to Modhesh World and embark on exciting adventures this summer and enjoy free entrance every Sunday from 24 June until 19 August 2018. The offer invites all UAE residents aged 4-10 to experience Modhesh World at Dubai World Trade Centre to enter free of charge every Sunday until 19 August 2018. Prior registration by parents is required via the Modhesh World website and a confirmation email must be presented at the entrance and an Emirates ID may be requested. Up to 5 children per family within the designated age range can enter free of charge on Sundays, with games and F&B offerings to be paid for separately. Kids can enjoy a fun-filled environment jam-packed with activities to get their adrenaline pumping at the Amusement Park with slides and zip lines, and stroll through the classic funfair favourites with bumper cars, water slides, trampolines, mini trains, and more! Spread across eight halls at Dubai World Trade Centre, children can climb, ride, skate, zipline, drive, create, read, explore, eat and so much more all summer long! 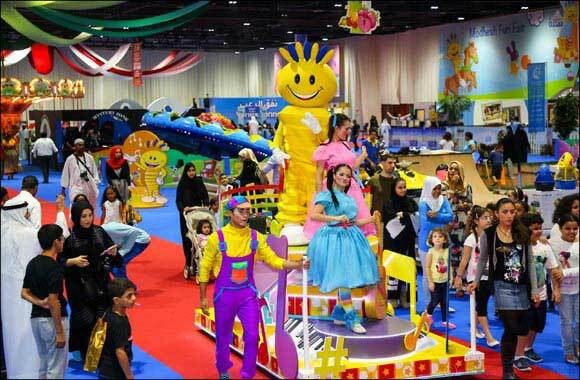 Modhesh World, in its 19th edition this year, offers a fresh, imaginative and colourful world to visitors of all ages with an extensive range of games, rides, entertainment and activities catered to all ages. Held at the Dubai World Trade Centre, Modhesh World, in partnership with DEWA, will run until 25 August and is organised by Dubai Festivals and Retail Establishment (DFRE), an agency of the Department of Tourism and Commerce Marketing (Dubai Tourism), and forms part of DFRE’s much awaited annual summer calendar of festivals and celebrations aimed at positioning Dubai as the summer destination of choice. Modhesh World is open from 10am to 11pm on weekdays and from 10am to 12am on weekends. Entrance is AED 25/-. Free for children under 3 years, senior citizens, and people of determination. Visitors can also avail a Happy Pass for only AED199 on weekdays from 10am to 2pm and enjoy entrance and unlimited play! Valid from 18 June. Terms and conditions apply. Modhesh World is held at Dubai World Trade Centre, in partnership with DEWA. The summer entertainment activation is also sponsored by Zoom, the minimart and fashion retailer, Splash, part of the Landmark Group. VLCC is the support partner of the fair. HTC is the official Virtual Reality gaming partner. Gargash Motors is the official car partner of Modhesh World.